36 CONV SDN SURVEY: ARE YOU IN? 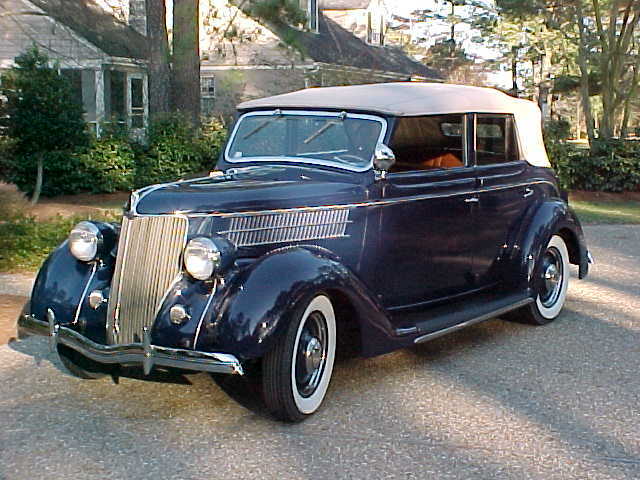 5,601 1936 Ford Convertible Sedans were produced. I purchased from a CA company that is accepted as an authority by the insurance industry, the number of 1936 Ford convertible sedans "that can be proven to exist today" according to them. They said there were only 107. 12/21/2007 Just a quick note to update the numbers on total cars found. We now have 168 cars with 65 being slantbacks and 103 are trunk models. We have not been able to further narrow the gap wherein the changeover took place thus far but we are still waiting on numbers from several of the recently discovered cars. THANKS for the continued help from everyone and please have a very Merry Christmas! 12/24/2008 Just a quick note to update the numbers on total cars found. We now have 173 cars with 68 being slantbacks and 105 are trunk models. We have not been able to further narrow the gap wherein the changeover took place thus far. THANKS for the continued help from everyone and please have a very Merry Christmas! 12/24/2011 Just a quick note to update the numbers on total cars found. We now have 188 cars with 76 being slantbacks and 112 are trunk models. We have not been able to further narrow the gap wherein the changeover took place thus far. Our lowest body ID tag number is 113 and the highest is 5581. THANKS for the continued help from everyone and please have a very Merry Christmas! 12/25/2013 Just an update on the numbers on total cars found. We now have 195 cars with 78 being slantbacks and 117 are trunk models. We have not been able to further narrow the gap wherein the changeover took place thus far. Our lowest body ID tag number is 113 and the highest is 5581. THANKS for the continued help from everyone and please have a very Merry Christmas! 1/7/2018 I'm a bit tardy with this update but we now have 203 cars with 80 being slantbacks and 123 being trunk models. I'm sorry to report that we have not further narrowed the gap wherein the changeover took place. Thanks for the continued help from everyone and I hope you had a very Merry Christmas! HIGHEST SLANT BACK BODY SEQ NO. AND LOWEST TRUNK SEQ NO.